Big Mouths are hungry. These robins will soon fly away on their own, just as each of us does over and over. Baby robins. Mouths wide open. I watched them a long time, but they did not move a muscle until Momma returned with worms. Is this like waiting for school to be out or for the swimming pool to open or for vacation time to start? Some things take a long time, a very long time. Like Gordon Parks waiting for white people to honor black people like him. Gordon, born in 1912, spent his whole life waiting for fair chances. When he was nine years old, white boys threw him in the Marmaton River in Fort Scott, Kansas, when he didn't know how to swim. But he persisted and survived. When he was a young man, people laughed at him when he wanted to earn some money as a photographer. But he kept asking until Madeline Murphy said, "Yes." And later, policemen stopped him and asked for proof that he owned the big car he was driving. They thought he might have stolen it. He kept his cool, showed them his car registration and drove on. He had what the robins had -- persistence and belief. He wouldn't give up and he believed he was valuable. My book about Gordon tells how his mother helped him build that belief in himself. She refused to be stopped by others' prejudiced attitudes, and she taught Gordon how to be strong. He learned how to give honor to others when they might not deserve it, such as when someone bullied him. He honored many, many poor people by making famous photographs of them for Life magazine. He encouraged young black people to go after their dreams, no matter what. I met Gordon when he was 91 years old. He told me about the hard times he suffered just because he had black skin. Racists beat him up, wouldn't give him jobs that he really needed, and called him nasty names. He kept going. Everybody waits. Everybody wonders if they'll get what they want. The baby robins will find out some day soon if they get what they want. 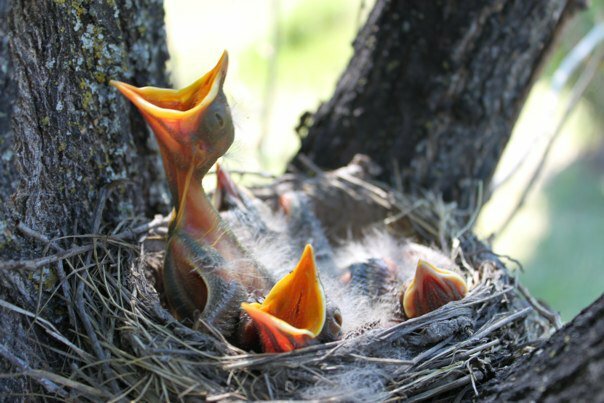 They will fly away on their own, filling their mouths with worms and seeds and grains, no longer dependent on Momma to come do it for them. That's everybody's challenge--young, not so young, and not young at all. To follow the robins' example and be strong, persistent, and learn how to feed yourself. That's how goals and dreams and big ideas move from waiting to happening. What is waiting in your "big mouth"? What can you do to feed yourself--even today--and not wait for someone else to get you started or do it for you? The waiting might be over!